This guide shows you how to set up Incoming Feedback on your site. Click on Setup Incoming Feedback to customize and activate the Incoming Feedback widget on your site. Name your Incoming Feedback widget. This includes options for language, position, and colors. Business customers can also opt to remove the branding and change the reaction style. The language selected here only affects the components of the widget which are not customizable. This includes the rating labels, input placeholder text, and Send or Skip buttons. For widget position, bottom left or bottom right will appear like the one below, with a short, customizable welcome text. If you select middle left or middle right the widget will be more compact, and no welcome text will be shown. The label will reflect your language choice. Custom placement of the widget other than what is in the drop down menu is not available at this time. Accent color controls the appearance of the widget and other elements on your site. You may want to customize it to match the colors or theme in use on your site or choose a color to make it stand out. For the accent color, either click to select from a color picker, or paste the hexadecimal color code directly into the box. Alternate colors allows you to customize the color of contrasting elements in the widget. Choosing to hide the branding and change the Reaction Style of the emojis is currently only available on our Business and higher plans. For more information on our Business plan, check out our Business Plan Breakdown article. Customize the messaging shown to your visitors. You might like to tailor these messages to suit your site's content. Selecting the option to automatically include a screenshot with the user's feedback will automatically capture a full page screenshot with every feedback response that is received; in this case, users will also have the option to select a single element from the page. On the other hand, when disabled, no screenshots will be captured unless the user specifically selects an element. If you want to show an invitation message place the widget on the bottom left or bottom right. You have the option to choose which particular devices or specific pages on your site the widget appears. You can also add multiple negative targeting rules to limit the pages where the Incoming Feedback is shown. The widget will not be shown on any page that matches these rules. Plus customers also have the option to only show the Incoming Feedback widget to a percentage of visitors. This can be helpful to control responses from high traffic sites. Add an email for Forward Feedback. If you have opted to collect emails from visitors giving feedback, you can have these feedback messages forwarded to an email address when visitors provide an email address. This allows you receive this feedback directly, and respond back to the visitor. 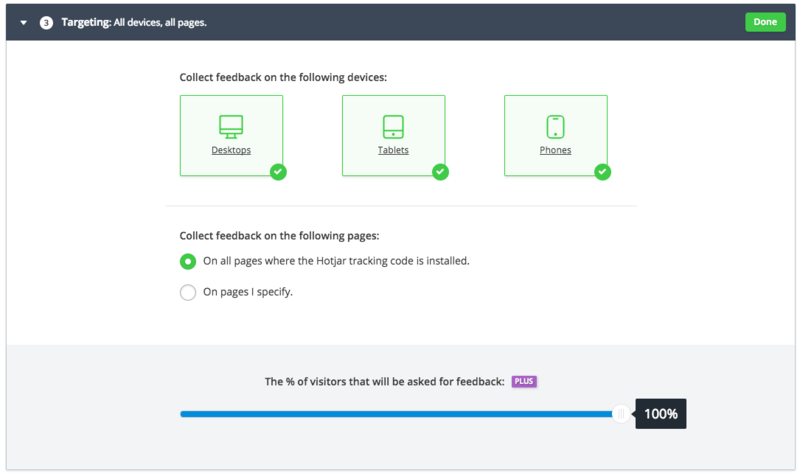 You can set up multiple instances of Incoming Feedback across different pages of your site. This might come in handy if you want to display the Incoming Feedback widget in different styles across different page types, or if you have a website that offers content in more than one language and want to talk to your audiences in their native language.